This member spotlight features an interview with @KateFlatley, founder and Executive Director of the Women’s Justice Initiative in Guatemala. WJI piloted its first legal empowerment program, Women’s Rights Education Program, in 2011. Between 2012 and 2015, WJI developed three complementary community justice and advocacy programs: Legal Services Program, Community Advocates Program, and Adolescent Girls Program. WJI improves the lives of indigenous Guatemalan women and girls through education, access to legal services, and gender-based violence prevention. What kind of issues does your legal empowerment work address? WJI works in rural Maya communities in Guatemala where women face extreme poverty and have little or no access to social services, making them especially vulnerable to violence, inequality, and discrimination. Guatemala faces some of the highest levels of violence against women and girls (VAWG) in the world: 27.9% of women suffer from intimate partner violence (IPV) in their lifetime and the country has the third highest femicide rate globally. Rural, indigenous women are disproportionately impacted due in part to their social isolation and limited access to resources. How are you using legal empowerment to address the problems? WJI addresses the challenges indigenous Maya-Kaqchikel women face by providing free, culturally grounded legal support, bilingual legal education, and leadership training in rural Guatemala through its four programs: Women’s Rights Education, Legal Services, Community Advocates, and Adolescent Girls. 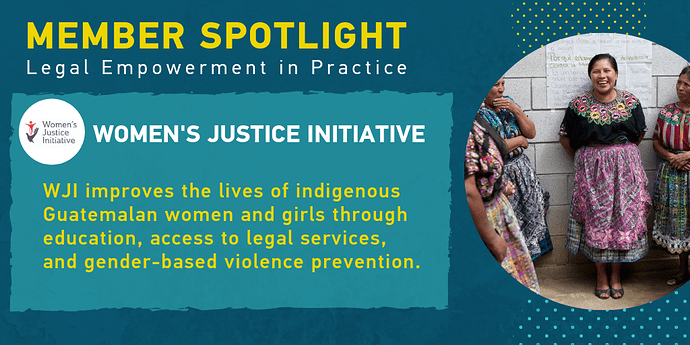 WJI’s legal empowerment programs improve access to justice for women and girls in rural communities and transform norms and attitudes that view VAWG as acceptable. WJI contributes to national efforts to combat VAWG by responding to critical gaps in existing services in rural areas and linking its community interventions with the larger national response. WJI’s interventions demonstrate that community-based responses are a feasible and necessary component of a comprehensive response to VAWG. Since 2011, WJI has directly benefited over 13,000 individuals and has provided legal support to women and their families in 1,349 cases. Over 600 community leaders, police, judicial, and health officials have received capacity-building workshops on VAWG prevention and training to improve responses to cases of violence. Forty-five local women were trained as Community Advocates, also known as grassroots legal advocates or community paralegals in other contexts, who provide support for women and girls in their communities. After completing WJI’s programs, 42% of participants sought legal aid from WJI, a 950% increase from baseline, where 4% of women reported having received legal aid in the past. Innovation- Is there an aspect of your legal empowerment work that is particularly innovative? WJI uses an innovative, ecological approach that prevents VAWG in rural communities through the combined implementation of comprehensive legal empowerment initiatives with mobile legal outreach. By increasing women’s knowledge of their rights and improving self-esteem and communication skills, WJI’s participants are better able to exercise their rights to live free from violence. Simultaneously, WJI increases participants’ access to justice by providing mobile legal outreach in their communities, ensuring that they can access legal services to protect these rights. WJI has found that this combined training and service delivery model is successful in empowering women to identify their legal needs and initiate legal processes both in cases of VAWG and in securing economic rights through land titling, child support, alimony, and inheritance cases. WJI is also piloting the innovative use of technology to increase legal outreach in rural communities. WJI performs legal outreach and increases access to justice through legal consultations conducted over video calls on tablets from women in rural communities to WJI’s legal team. What are the strategies you employ to ensure the long-term sustainability of your work? Legal empowerment activities are sustained by the involvement of Community Advocates, trained by WJI, and through collaboration with community actors and partner institutions. Community Advocates are active in the dissemination of rights information in their communities and are sources of knowledge and support for their peers. Community Advocates’ presence and advocacy helps destigmatize discussing and addressing VAWG in rural communities, enabling survivors to come forward and access justice. To further ensure sustainability, WJI partners extensively with public sector organizations to expand the provision of legal services to indigenous girls and women and strengthen the Guatemalan institutional response to cases of VAWG. WJI also works with national and international civil society organizations to bring awareness to the issues facing indigenous women and girls in Guatemala and consult on responding to VAWG. Do you have any advice for other organizations about achieving scale? In order to scale up in the future, WJI understands that its network of Community Advocates will be key, alongside increased regional partnerships. WJI has successfully piloted a model of capacity-building of local actors, Community Advocates, who become legal advisors and mentors in their communities. It is through this innovative and essential focus on peer to peer legal empowerment that WJI responds to the roots of unequal power relations to achieve increased justice for Maya women. WJI also recommends building strategic partnerships with local allies, NGOs, and municipal providers to scale. Member Spotlights are short interview profiles focusing on members of the Global Legal Empowerment Network. Spotlight articles use case studies to provide useful insights into the work of other network members. Whether you are working in the same country, with similar issues, or want to understand new legal empowerment approaches, the Member Spotlight is a useful learning resource. You can read more about other organizations in our network here (https://community.namati.org/tags/spotlights) or by searching spotlight in our forum.